Neuroscientists using a supercomputer to run a simulation of a neural network, have noted that the response time of the brain is the same regardless if the number of neurons in the network is 50 or 1,000. The constructed computer simulation of the neural network showed that the simulated neurons responded with the same speed on both models. Neurons are responsible for transmitting information and signals to and from the brain. 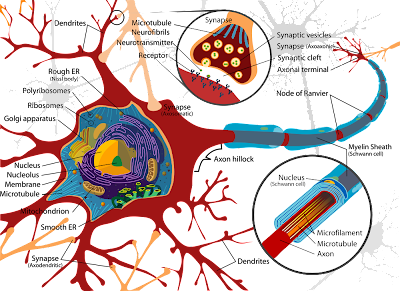 These cells are the main component of the nervous system which includes the brain, spinal cord, and peripheral ganglia (relay points and intermediary connections between different neurological structures in the body). There are around eighty to one hundred billion neurons in the human brain. These are interconnected to each other by around one hundred trillion synapses to form the neural network. This network transmits information through electrical and chemical signals between the body and the brain. About 15% of the cardiac output, 20% of the body's oxygen, and 25% of the body's glucose utilization are the resource requirements of the neural network to perform efficiently. The purpose of the study is to explain long standing questions on the neural network such as neural coordination, network behavior, size requirements, and response times (how the neurons are coordinated to trigger a movement at a particular point in time). The neuroscientists at Vanderbilt University constructed the computer simulation using Vanderbilt's in-house supercomputer at the Advanced Computing Center for Research & Education. Even with the computing power of a supercomputer, the simulation can only model a neural network of up to 1000 neurons. Last spring, President Obama established the federal BRAIN Initiative to give scientists the tools they need to get a dynamic picture of the brain in action. To do so, the initiative's architects envision simultaneously recording the activity of complete neural networks that consist of thousands or even millions of neurons. However, a new study indicates that it may be possible to accurately characterize these networks by recording the activity of properly selected samples of 50 neurons or less – an alternative that is much easier to realize. The study was performed by a team of cognitive neuroscientists at Vanderbilt University and reported in a paper published the week of Feb. 3 in the online Early Edition of the Proceedings of the National Academy of Sciences. The paper describes the results of an ambitious computer simulation that the team designed to understand the behavior of the networks of hundreds of thousands of neurons that initiate different body movements: specifically, how the neurons are coordinated to trigger a movement at a particular point in time, called the response time. The researchers were surprised to discover that the range of response times produced by the simulated population of neurons did not change with size: A network of 50 simulated neurons responded with the same speed as a network with 1,000 neurons. For decades, response time has been a core measurement in psychology. "Psychologists have developed powerful models of human responses that explain the variation of response time based on the concept of single accumulators," said Centennial Professor of Psychology Gordon Logan. In this model, the brain acts as an accumulator that integrates incoming information related to a given task and produces a movement when the amount of information reaches a preset threshold. The model explains random variations in response times by how quickly the brain accumulates the information it needs to act. Meanwhile, neuroscientists have related response time to measurements of single neurons. "Twenty years ago we discovered that the activity of particular neurons resembles the accumulators of psychology models. We haven't understood until now how large numbers of these neurons can act collectively to initiate movements," said Ingram Professor of Neuroscience Jeffrey Schall. No one really knows the size of the neural networks involved in initiating movements, but researchers estimated that about 100,000 neurons are involved in launching a simple eye movement. 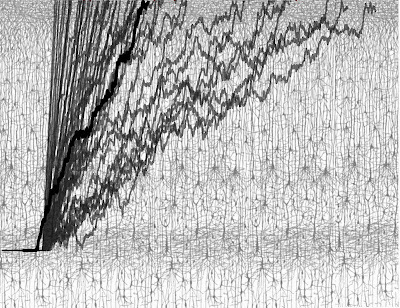 This is a group of model accumulators overlaid on a drawing of cortical neurons made b the 19th century neuroscientist Santiago Ramon y Cajal. "One of the main questions we addressed is how ensembles of 100,000 neuron accumulators can produce behavior that is also explained by a single accumulator," Schall said. "The way that the response time of these ensembles varies with ensemble size clearly depends on the 'stopping rules' that they follow," explained co-author Thomas Palmeri, associate professor of psychology. For example, if an ensemble doesn't respond until all of its member neurons have accumulated enough activity, then its response time would be slower for larger networks. On the other hand, if the response time is determined by the first neurons that react, then the response time in larger networks would be shorter than those of smaller networks. Another important factor is the degree to which the ensemble is coordinated. "The more the ensemble is coordinated, the more the collective resembles a single accumulator. What has been unknown is how much coordination is necessary for the ensemble to act in unison, " said Bram Zandbelt, a post-doctoral fellow and lead author on the paper. To address this problem, the researchers developed a new type of computer simulation, one that models the collective behavior of different numbers of accumulators given different amounts of variation in the rates of accumulation. The simulation took a tremendous amount of computer power. Even using Vanderbilt's in-house supercomputer at the Advanced Computing Center for Research & Education, Zandbelt was limited to modeling networks containing 1,000 neurons. The researchers found that the networks did not produce realistic response times if responses were initiated when only a few or almost all of the simulated neurons finished accumulating, or if the simulated neurons had very different accumulation rates. However, the networks produced realistic response times over a broad range of stopping rules and similarity in accumulation rates, showing that within these broad constraints, size doesn't matter. "We were surprised to discover that the networks behaved with a remarkable uniformity except under extreme assumptions," said Schall. "As far as the response time goes, the bottom line is that we found that the size of the neural network doesn't matter under a large set of conditions. If this is true for networks ranging from 10 to 1,000 neurons, it should also hold for networks of 10,000 to 100,000 neurons," Palmeri said.